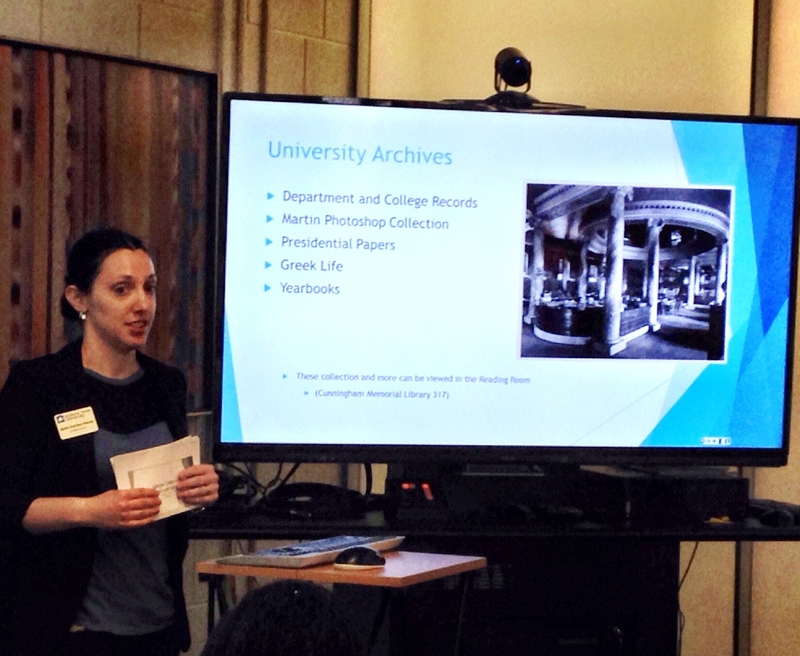 On Friday, May 15, Kayla Siddell (Data Curation Librarian) and Katie Sutrina-Haney (University Archivist) joined several other ISU staff to present Thinking Outside the Box – Unique and creative ways to engage students in deep learning of course content. 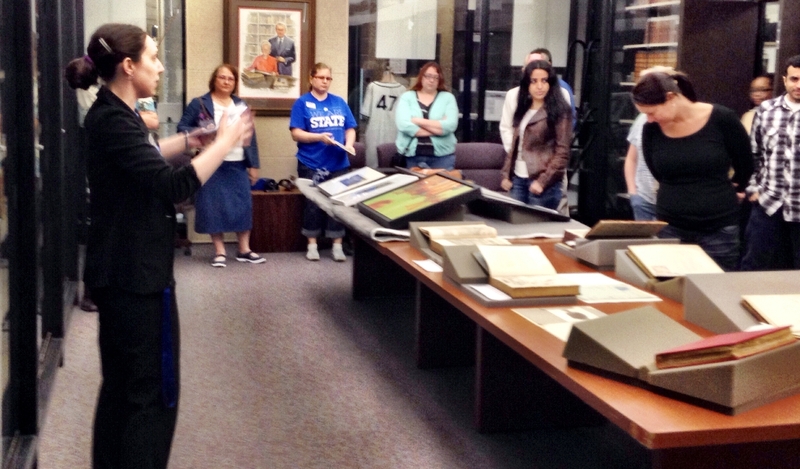 Presenting on Special Collections generally to a full room, everyone then went on a field trip to the Library’s Special Collections area, where materials were on display, and where we were joined by Permanent Art Collection Curator, Jason Krueger. Librarians Brian Bunnett and Marsha Miller attended the session; Miller had the fun opportunity to introduce several people to the stereopticon (the original 3-D experience). 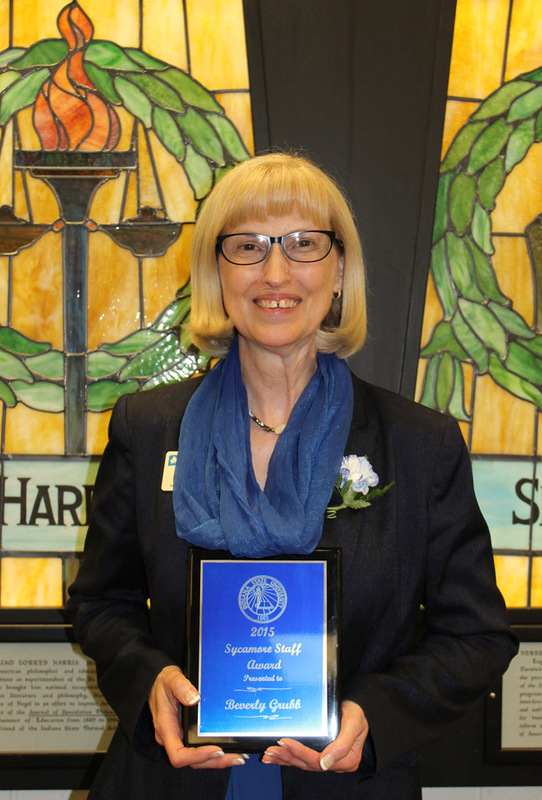 Beverly Grubb honored with the 2015 ISU Sycamore Staff Award! 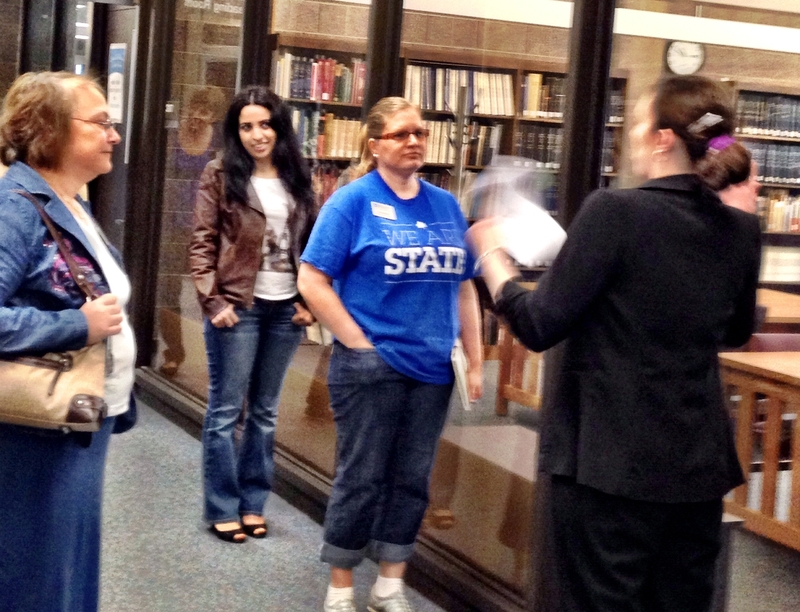 The Sycamore Staff Award recognizes a staff member who contributes to the overall mission and success of Indiana State University. There were 19 nominees this year and Bev was the top choice of the staff awards committee. Attitude-demonstrates an outstanding personal and professional interaction with co-workers, faculty, students, and visitors of Indiana State University. Service-provides a continual demonstration of outstanding service in all their activities and responsibilities within their department, within the University community, and the community at large. Engagement-provides outstanding resourcefulness, innovation, and creativity in all their activities and responsibilities within their department, within the University community, and the Community at large. 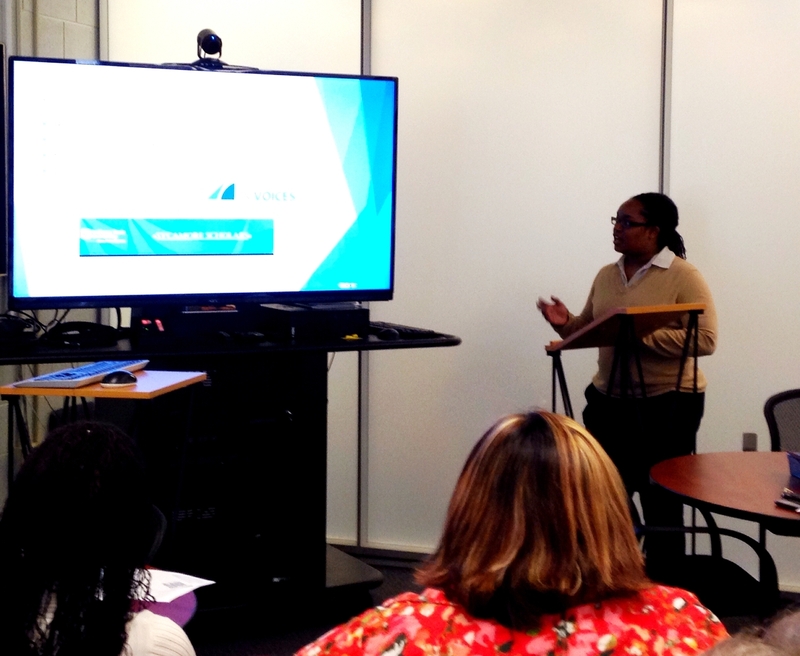 Contribution-contributes to and supports the Council by their attitude, service, and engagement. (But does NOT have to be on the Council). From the Call for Proposals: Library technologies evolve at a rapid rate, and require continual assessment and adaptation of services. Yet, technical services librarians meet these challenges and develop innovative ways to recreate services for the information needs of library users. You are cordially invited to come and share with others how you are using emerging technologies to reinvent services at your library. 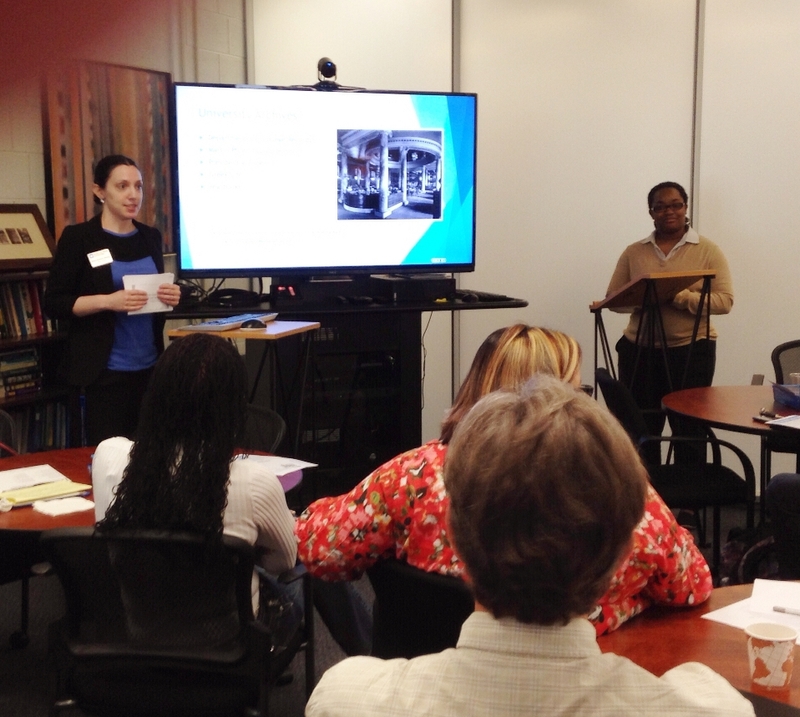 More than 100 librarians will be attending the 2015 Ohio Valley Group of Technical Services Librarians The Ohio Valley Group of Technical Services Librarians (OVGSTL) was founded in 1924 and draws its members from the states of Indiana, Kentucky, and Ohio. The annual conference rotates among these three states on a regular basis. 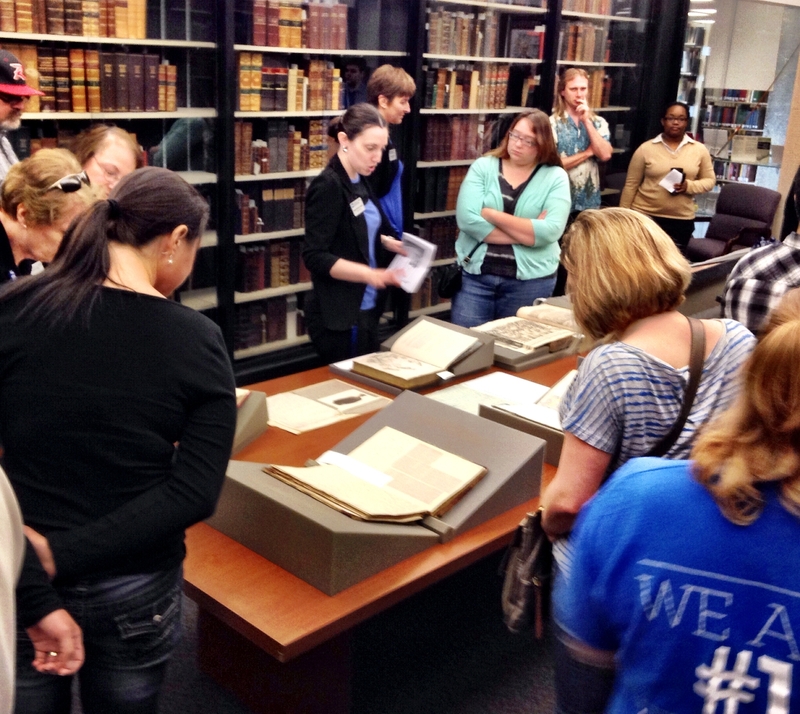 Membership is open to anyone interested in library technical services. 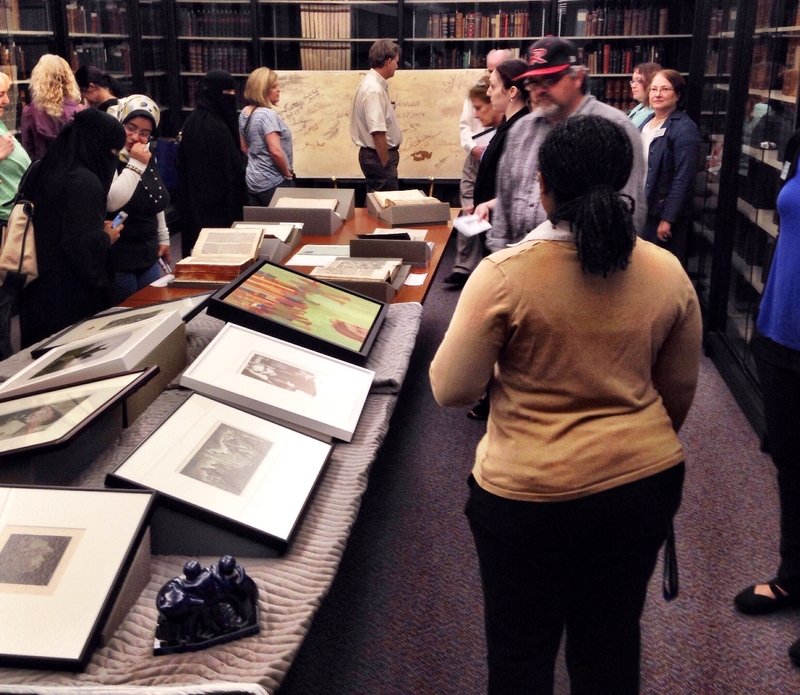 Special Collections [3rd floor] presents its new exhibit, “Hooray for the Summertime”, curated by Dennis Vetrovec and Josh Stabler. 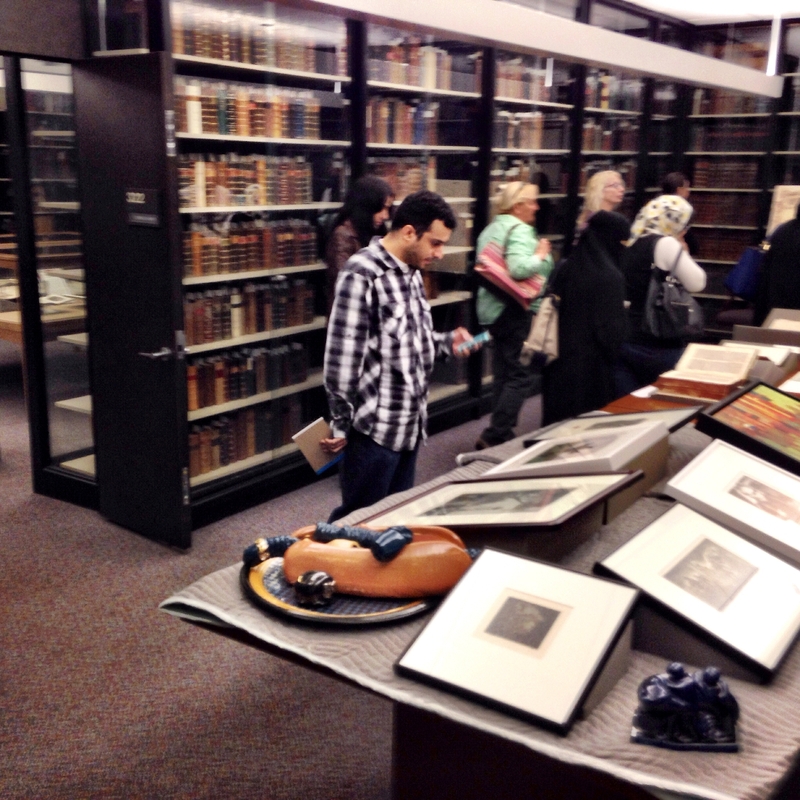 The exhibit celebrates the arrival of warm weather and illustrates the concepts of play, work, adventure, and music through the use of materials from the Rare Books and Manuscripts collections and University Archives. 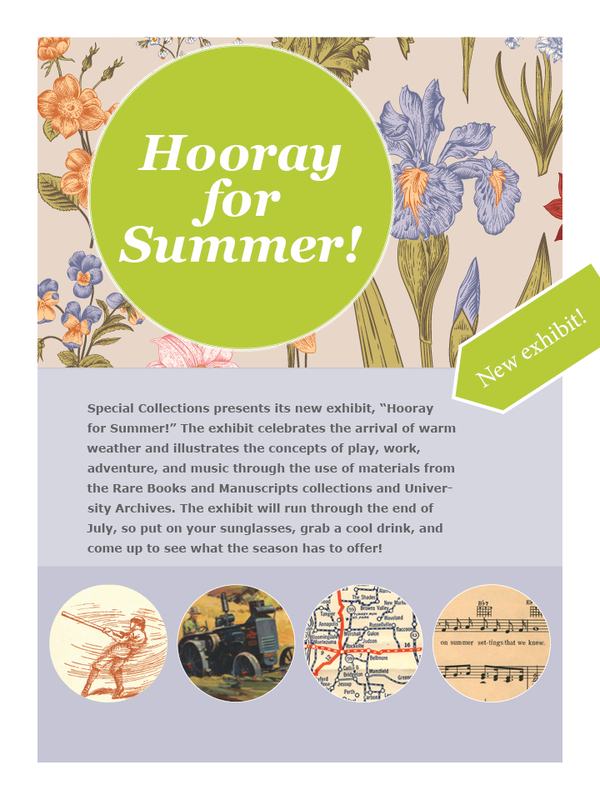 The exhibit will run through the end of July, so put on your sunglasses, grab a cool drink, and come up to see what the season has to offer. May 11-15, Monday-Friday, 8:00 a.m. – 5:00 p.m.
Only a few of weeks into the job, the new curator of the Indiana State University Permanent Art Collection is preparing one of its most valuable pieces for a bon voyage. Jason Krueger, a 2013 Master of Fine Arts graduate, departed Monday for Marseille, France, with “Smoke Stacks,” a 1935-era oil on canvas by Joseph Stella. Packaged in a special waterproof crate, the Stella piece — valued as much as $1.5 million — will be accompanied by Krueger through the backdoors of customs areas and have its own trucks for transportation. Krueger will additionally be carrying white gloves in case customs wants to check the painting. The packaging crate is so specific that the manufacturer was concerned the painting wouldn’t fit after learning Krueger intended to wrap it in protective paper. “So, the thickness of the paper on two sides mattered. It just fit in the box,” he said, adding that it took two hours to get it packaged. On the plane, “Smoke Stacks” will be held in a climate-controlled, pressurized portion of the cargo hold. “If we crash in the middle of the ocean, ostensibly, the black boxes and the Stella will survive and nothing else. You won’t be able to find it, because it won’t have a beeper on it. But it’ll be there,” he said. 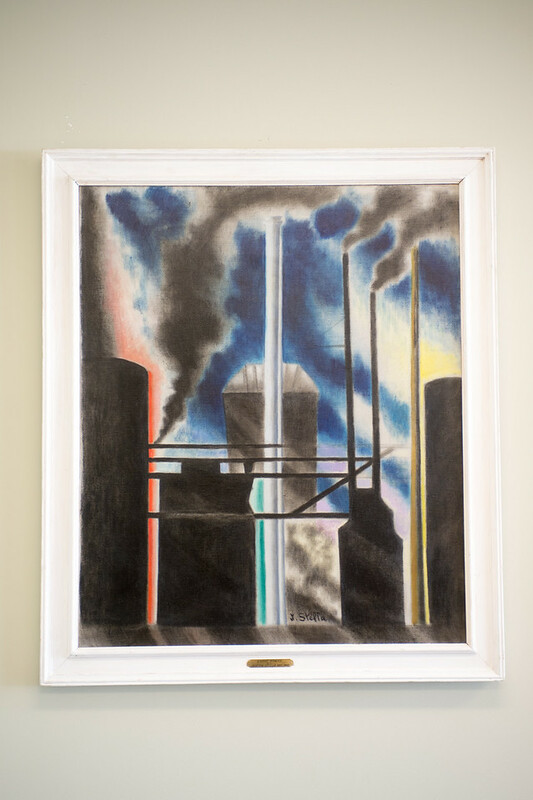 “Smoke Stacks” is part of the “FUTURS: De la Ville aux Étoiles” exhibit, running May through October, that explores the impact of science, industry and technology on the inspiration of modern artists leading to works that are poetic, futuristic and/or portray utopias. Stella’s works will be displayed in the room of a Roman-era building with recessed windows that project same shape of light that Stella portrayed in his paintings. “Smoke Stacks” has travelled so much that when it returns in the fall, it’ll go into storage to “rest,” rather than being returned to the office of John Murray, dean of the College of Arts and Sciences. As with any transition, there’s the usual untangling of websites and files, and Krueger has been researching software specifications to determine what’s best for managing the collection — keeping it both safe and accessible. “Part of my job is going to be putting up the rest of the great work that we have so that people can find it in an online catalog,” Krueger said. 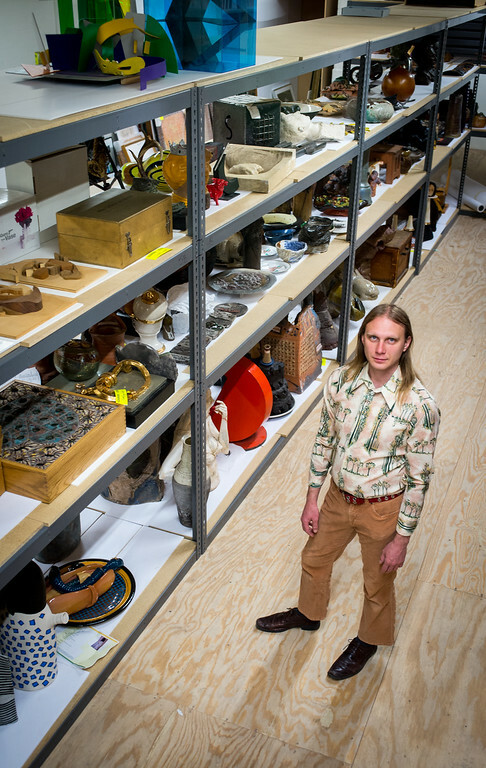 Sorting out what should be in the Permanent Art Collection, which includes two-dimensional art, as well as ceramics and sculptures, is another challenge for Krueger, as the collection has a “long and varied history” of how pieces were introduced. Some pieces were gifts from individuals or institutions, while others were purchased by a department or the university. 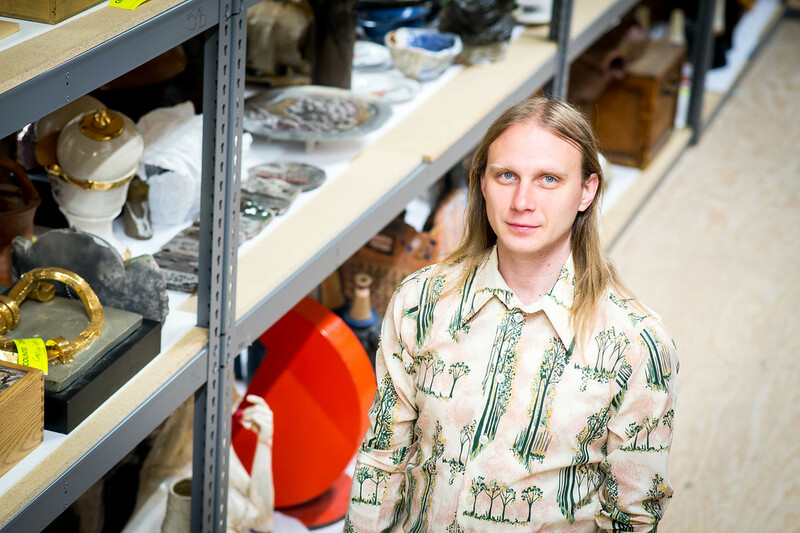 “What I’m going to enjoy the most is seeing the collection grow and develop into something that reflects the strengths on campus and shares that with the campus and broader collection,” Krueger said. 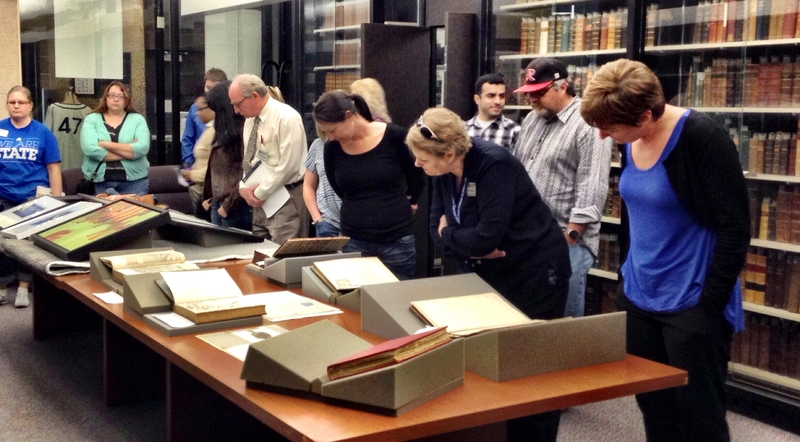 Pieces in the Permanent Art Collection can be loaned to university offices through an application process. As in the Stella piece, “there are instances when it’s important for the collection or scholarship for us to break those loan agreements. I hope it happens a lot, but I hope not to the point where people feel it’s disruptive,” he said. Krueger would like to start a conservation cycle of the collection’s key pieces, with “Smoke Stacks” taking priority. “It’s in really good shape, but I’m sure there are things we can do to make sure that it continues to be in great shape,” he said. Photos: http://isuphoto.smugmug.com/Other/Media-Services/Media-Arts-and-Sciences/Jason-Krueger-Permanent-Art/i-vwR8Gb7/0/XL/05_01_15_Jason_Krueger-64-XL.jpg — Jason Krueger, curator of the Indiana State University Permanent Art Collection, poses for a portrait in the storage area. http://isuphoto.smugmug.com/Other/Media-Services/Media-Arts-and-Sciences/Jason-Krueger-Permanent-Art/i-Bz5W3Lm/0/XL/05_01_15_Jason_Krueger-45-XL.jpg — Jason Krueger, curator of the Indiana State University Permanent Art Collection, poses for a portrait in the storage area. http://isuphoto.smugmug.com/Other/ISUphotoservices/Photography-Services-Miscellan/Stella-Painting-2015/i-QWVNpXr/0/X2/02_02_15_stella_painting-7305-X2.jpg — “Smoke Stacks” by Joseph Stella (Italian-American, 1877-1946), oil on canvas, 36×30 inches, c. 1935.